Since July 2017, there have been five completed sales in Anniedale-Tynehead, covering 30 acres. All of this land is designated but not yet zoned for high-density residential under the city’s 2012 neighbourhood concept plan. Most recent land sales in the area, however, have been “off-market” and have 12-to-18-month completions, according to a spokesman for Frontline Real Estate Services, which sold a one-acre site in the area last April for $1.8 million. 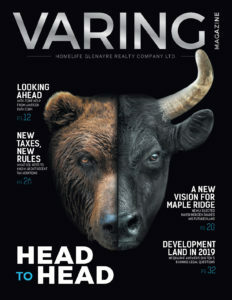 The long completions reflect the lack of servicing agreements to the site and the current slump in the Fraser Valley residential market, said Joe Varing, president of Varing Marketing Group with Homelife Glenayre Realty Co. Ltd., who has also been active in Port Kells.